Nouvelle propriété avec de superbes vues. Un charmant appartement de 3 chambres et 2 salles de bains. Dans le quartier des Mouilles, à seulement 7 à 10 minutes à pied du centre de Chamonix. 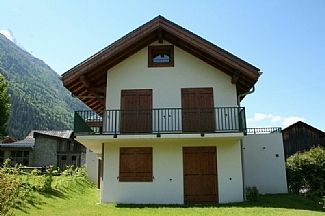 L'appartement bénéficie d'une position rurale très calme avec de superbes vues sur la vallée de Chamonix depuis les 3 balcons. Chambre 3 a un lit double, ou 2 lits simples, donc 2 personnes supplémentaires ou des enfants peuvent être logés. En bas, il y a une salle à manger et un salon avec feu de bois et une cuisine complète. Salle de bain et WC séparés. A l'étage il y a une zone de la galerie de la télévision. La propriété dispose d'un garage pour les skis et un parking. Salle de bains 1, baignoire bassin / douche, sèche-serviettes. WC séparé. Salle de bains 2, salle de bain / douche lavabo, WC et sèche-serviettes. Notes sur l'hébergement: L'appartement se prête à 3 couples ou 2 familles de 4. Cet appartement est non fumeur. Pas d'animaux sans accord préalable. Dehors: Balcon entoure la propriété. Chaises à l'extérieur et table pour manger à l'extérieur, balcon sud-ouest grande pour tranquillisants soleil. Il ya un grand garage simple pour les skis et buanderie et un parking pour une voiture. Plus parking est à la fin de la voie. Buanderie: Dans le garage il ya une machine à laver réfrigérateur / congélateur et sèche-linge, + 2 chaises hautes. Service de nettoyage / serviettes / / Femme de ménage: Serviettes et linge de maison inclus comme standard propre après la location. Really cosy and just perfect for our 6 night Christmas holiday with gorgeous views of the snow covered back yard and mountains. This place is so well set up and Simon was always available to answer my many questions. Loved the little things like the fondue and raclette sets, washing machine and dryer and quality linen and crockery. Short distance to walk into centre of town and there is a bus at the end of the street that takes you to the city centre or to the other towns outside of Chamonix. Lara thank you for taking the time to review. Glad you enjoyed the visit. Look forward to seeing you guys again. The apartment was clean and comfortable. It was well equipped and very warm. It was about 10 mins to town center, Simon was great to deal with and we were met on arrival...all and all it was a great place to stay. My little family of 4 stayed in this lovely appartment late june 2016. And we really enjoyed every moment. Very clean and well equiped and such a cosy atmosphere. Plenty of space and nice view on the mountaintops around. Could sit and enjoy the paragliders from the balkony, landing just a stonethrow away. And when it rained to heavy just a perfect place to be and relax. But it is the mountains you are here fore, and a cablecar to the top is a must. Reaching out for Mount Blanc. And with a short walk to towncenter, cablecars and trainstation this appartment is perfect sittuated in a quiet little street. I think it is worth a stay. We went in July 2015 and had superb hot sunny weather for the two weeks. Chamonix is fantastic in summer.The apartment is really well located, just a 10 minute stroll from the centre and the cable cars. We could easily walk to the Climbing World Championships in the square.The apartment is clean and well appointed. It is very useful having parking in the garage. You can get quite big vehicles in but it is fairly tight. There is a nearby patisserie shack to get croissants in the morning. We did quite a few walks from the top of cable cars and we would recommend that you work out how many of the main cable cars you will want to use and get a multi-pass for non-consecutive days’ right at the start. It is likely to be at least 4 – 5 days.The scenery around Chamonix is absolutely stunning. Going up the Aguille de Midi is a must.You’ll be surrounded by a mass of tourists but also serious climbers going out onto the ice. The white tops look stunningly beautiful but unless you are very experienced and competent, you cannot even begin to walk on them. They are completely different from the snow on UK hills because they are ice and glaciers which are really quite dangerous. We heard huge avalanches when we were up there. We would thorough recommend the walk from Plan de Midi to Hotel du Montenvers and the tunnel into the glacier. We’d recommend the cable car to Col des Grand Montets but also the cable cars up from Le Tour to the Col de Balme where there is a gentle stroll across alpine meadows into Switzerland. There is just a refuge/café and no boundary other than a small post. However the best thing ever is the tandem paragliding from the top of the Planpraz cable car which you can see from the apartment. You book it at the end of the road and land in the field also just at the end of the road. If you want you can quite easily fly over the apartment on your way in! It is breathtakingly superb. As it was so hot we went to the Lac de Passy where the kids went on the inflatable playground for hours. A fresh-water and warm lake with superb views of Mont Blanc. We also went white-water rafting and did quite a few low level valley walks as any climbing or even walking at mid-levels was quite wearing in the heat. We drove down from Roscoff but next time we would probably fly and hire a car because Geneva is only about an hour or so away and the roads are pretty easy driving even though people are saying it was very a busy time when we visited.